TULARE COUNTY – This weekend is your last chance to catch the Tulare County Office of Education’s production of Little Shop of Horrors. The popular rock musical about Seymour (played by Redwood High School’s Parker Chalabian), a hapless florist shop worker who raises a man-eating plant from outer space, is being staged in the 1980s, rather than the 1960s when it was originally set. Seymour, his man-eating plant, Audrey II (voiced by Redwood’s Andrew Cantelmi and puppeteered by Mt. Whitney’s Eli Adams), Mr. Mushnik (Redwood’s Bryce Huckabay), the crazed dentist, and all the supporting characters from their Skid Row neighborhood will be transported to the era of Madonna and Members Only jackets. 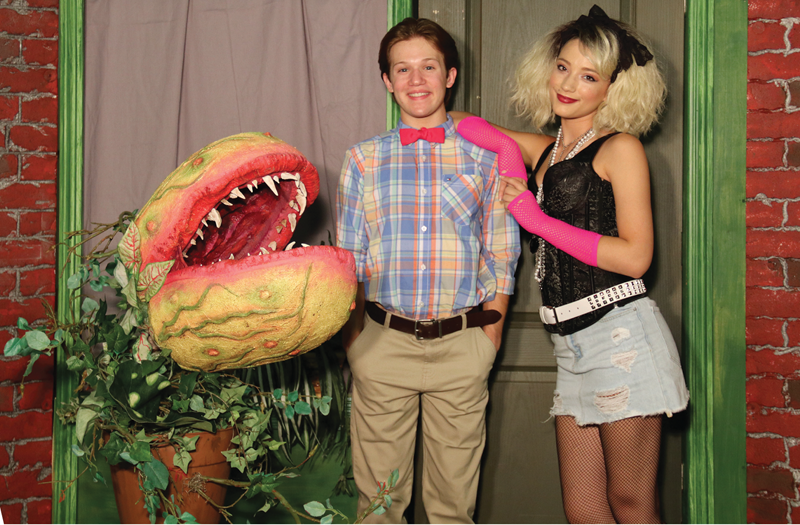 Little Shop of Horrors is a high-energy production from the moment the curtain opens. Remaining show times are 7:30 p.m. on July 26, 27 and 28 as well as a matinee at 2 p.m. on July 28 at the L.J. Williams Theater, 1001 W. Main St. in Visalia. Tickets are $15 for general admission and $25 for VIP tickets and can be purchased at the door or by phone by calling 559-651-1482, ext. 3329.